check out the others posts in the blogathon here. Some of the most iconic words in science fiction history. But the movie they come from isn’t as well known, which is a shame. It might be slightly cheesy at times, but ‘The Day the Earth Stood Still’ is a first-rate sci-fi film that can still resonate with audiences today (I know that because it resonates with me, lol). And one reason for its greatness is the robot, Gort. Yes, the special effects might be a bit, um, lacking, but when the spaceship lands in the ever familiar Washington D.C. area, Gort steps out, and Bernard Hermann’s chilling score plays, it’s pretty much impossible not to feel a little tingle of fear. Gort is able to destroy guns, tanks, and people with little to no effort. Once he’s effectively cowed the crowd, he stands still. No one can move him, no one can dent his ‘body’. So they end up putting him in a case made of special plastic. Nothing can break that – or so they think. Gort does eventually end up breaking out, though, and the results are…interesting. I won’t spoil anything in case you haven’t seen the movie yet! what is that random guy doing there? He was given unlimited power over his creators. Yep. Unlike other stories where the robots/AI are either completely subservient to their creators or have destructively taken over (usually leaving a dystopian world in their wake), Gort and his ‘brothers’ have been given control over their alien masters. Why? Well, the next point will address that. He has a sense of morality. Apparently, Klaatu’s countrymen were able to create robots with a sense of right and wrong. They then set those robots to police their countries and cities and destroy anyone who transgressed. So yeah. I mean, most filmic robots do have a sense of right and wrong (though, in real life, they wouldn’t) so maybe this point isn’t as unique. But Gort was literally created to have a moral code (that’s his purpose) so…still interesting. He can bring people back from the dead. Whether it’s something that Gort himself (itself?) does or only his knowledge of alien technology that allows him to operate a life-giving machine, he still brings a certain character back from the dead. (Obviously, this movie has some intriguing/problematic theological implications.) And again, that makes Gort a very interesting robot. So, have you seen ‘The Day the Earth Stood Still’? What are your thoughts on Gort and his powers? That’s a really intriguing premise! I wonder if they meant him to be a weird Christ figure of sorts. 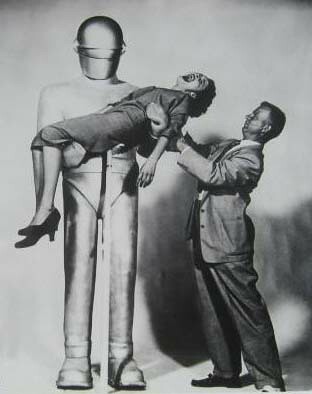 If Dr. Who and Superman can be Christ figures, why not Gort? That makes sense. Yeah, I’m always leery of the concept of Christ figures in fiction–they CAN be done well, but still, I’m always suspicious. 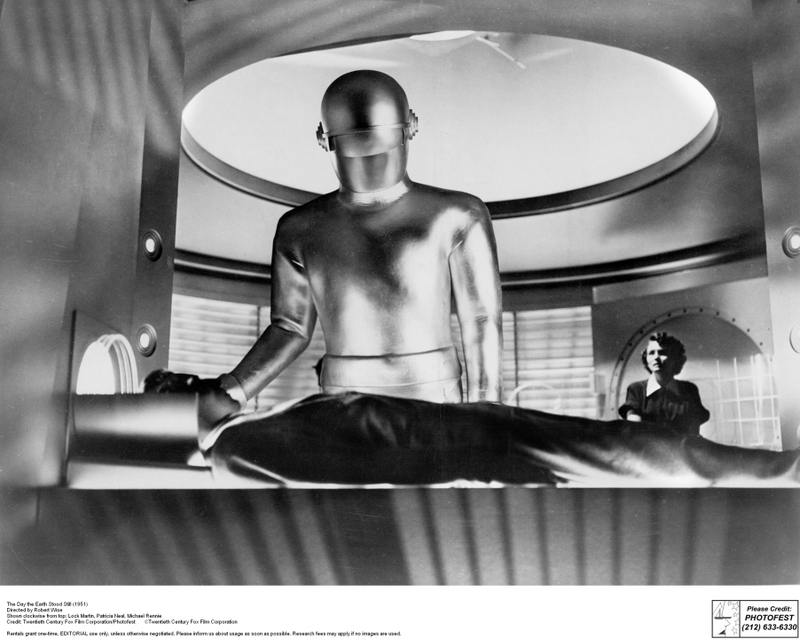 Yes, I don’t think Gort was meant to be a Christ figure – if anyone was, it would Klaatu. But either way, I don’t see them as Christ figures. This film does indeed raise a lot of interesting questions about morality. It’s one of the reasons I like it so much. The way the human characters react to the visitors intrigues me, whether it be suspicion or acceptance, it says so much about us. Yay! This film is a true sci-fi classic, and aside from the special effects, it’s pretty timeless. Hmm, I didn’t think about the implications of a character being brought back from the dead, but that’s probably because they hadn’t been dead for that long? It seemed more like a “miraculous” result of (very advanced) science. Agreed with comments about Christ-figures in fiction not necessarily being BAD, (I mean, we’re all called to imitate Christ right?) just tricky to pull off well. I thought what was meant as a theological reference was Klaatu going by the name “Mr. Carpenter”. I’ll admit that I hadn’t given a lot of thought to film’s implication that Gort is…more powerful than his makers. What could it mean? That a truly just, fair being would have to NOT be human? Or maybe be MORE than a human? Very interesting things to ponder! That’s an excellent point about Klaatu’s fake name! And all those questions you raised…man, this film gets deeper each time I watch it or discuss it with people. Thank you! Gort is definitely terrifying when ‘unleashed’, so to speak.